On Saturday (11/1/2014), Dr. Charla Lautar, along with senior dental hygiene students Alyssa LoVerde and Malia Casali, facilitated a workshop "Dental Hygiene - More Than Just Teeth" for SIUC's Expanding Your Horizon participants explored properties of various dental materials, learned how to place dental sealants and how to identify aspects of tooth anatomy. 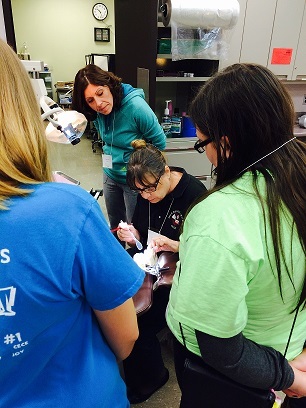 Participants were also introduced to "hands-on activities" that included simulated charting, mixing and pouring plaster, and applying pit and fissure dental sealants. Hopefully, these young girls in grades 5 through 9 will further investigate the art and science of dental hygiene as a career. The Expanding Your Horizons Network (EYHN) is a 501(c) nonpro­fit organization dedicated to providing gateway STEM experiences to middle and high school girls that spark interest in STEM activities and careers (www.expandingyourhorizons.org). Dr. Nancy Martin and Dr. Andrey Soares, along with a student volunteer, offered a “Build Your Own Mobile App with App Inventor” workshop to the Expanding Your Horizons participants on Saturday, November 1st, 2014 from 10:45am to 12:15pm in ASA C-112C. The event was locally sponsored by Women in Science and Engineering.